Imagine waking up one day to find part of your body has been removed. Not just any body part, but one vital to protecting yourself from danger. You'd probably miss your fingers quite a bit if they were gone, right? It's not acceptable to cut off a person's body parts, but too many people think it's OK to cut off a cat's. Declawing a cat is a form of unnecessary amputation that leaves her without a way to defend herself against predators. It also leads to a variety of emotional and physical issues she'll have to contend with for life. Some owners like to tell themselves the cat won't feel a thing, but that's a lie. At least 30 percent of veterinarians don't bother to provide pain medication, but even if they do, there's a chance it could wear off mid-surgery. Even after a successful surgery the pain doesn't go away immediately. If the claws aren't entirely removed, they can grow back into the paw pad, causing excruciating pain. The surgery has also been known to lead to abscesses and paw pad atrophy. One study showed that 25 to 50 percent of cats experienced complications in the first five months after surgery. 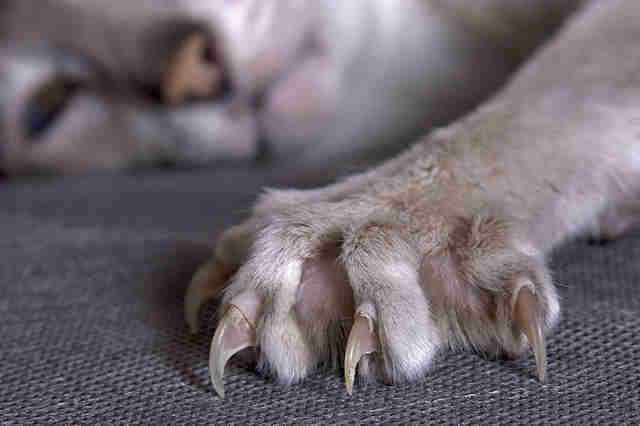 Claws protrude from the cat's feet and help keep her stable as she walks. Removing them throws her off balance and forces her to find a new way to keep herself from stumbling around. Without her claws a cat must alter the way her foot touches the ground to avoid pain. 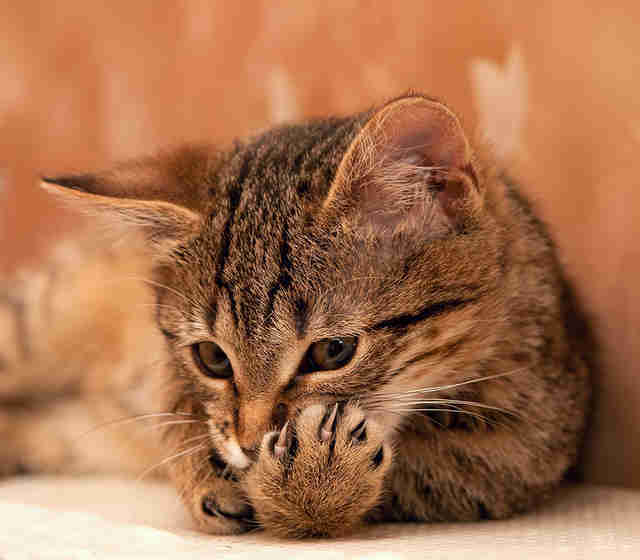 Declawing cats has shown to lead to an increase in eliminating outside the litter box. The rough litter on their sore paws is painful and leads them to look elsewhere for a place to go. Cats dig their claws into things to stretch and strengthen their muscles. Without them, they're no longer able to work the tissue properly, causing it to degenerate over time. This leads to chronic issues like arthritis as they get older. Cats use their claws to defend themselves against predators. Taking away their claws leaves them without any method to protect themselves. Imagine if your kitten got outdoors and couldn't defend herself! It can also lead to bullying from other household pets who are bigger than them. Cats who are declawed have also been known to use biting as a way to ward off threats which can lead to both strangers, owners and the cats getting injured. The back claws, if they remain, are an ineffective form of defense because they require the cats to lie on their back, leaving themselves vulnerable. Our fingernails can get annoyingly long, but we trim them instead of having them cut off. The same should go for your cat. You can clip or file the claws down to an appropriate length or find a trainer who specializes in behavior modification. They can help you teach your cat to scratch a provided post or pad rather than your furniture. This way, you save money on buying a new couch and your cat gets to keep the claws nature intended her to have. 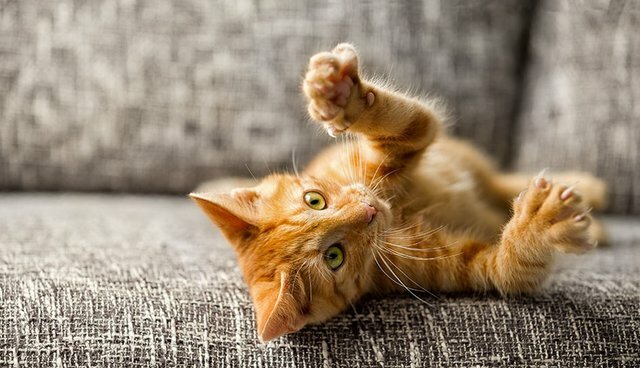 Organization like the ASPCA, the Best Friends Animal Society and The Paw Project oppose the inhumane practice of declawing cats, both large and small, due to the crippling effects it has on them and the loss of their ability to defend themselves. It can lead to permanent damage and pain for cats who are forced to undergo the procedure. Please, before declawing your cat, consider other options that will allow your friend to stay intact and safe.